Today I have the big daddy of gift guides for you – this is the beauty gift sets guide! There isn’t a girl in the world who would say no to a Christmas gift set – there’s something lovely about opening a special set or collection on Christmas morning, that you know someone has thought about and chosen just for you. Gift sets aren’t really something you’d buy yourself (except for in the sales maybe!?) so it really is exciting to find someone has been thoughtful enough to treat you at Christmas. So whether it’s for someone else or even yourself, I’ve included a variety of brands and products, covering skincare, bathing, fragrances and even feet so hopefully there’s something for everyone! Limited Edition Gift Set For Her* £49 by Molton Brown. Emjoi MICRO Pedi 11 Piece Gift Set* £49.99 by Micro Pedi. This Micro Pedi Eleven Piece set contains everything you need to get beautiful feet. The Emjoi Micro pedi safely removes rough of skin in seconds, leaving your feet beautifully soft, and the set also contains an extra coarse micro-mineral roller, ultra finishing foot cream, mani / pedi kit with five interchangeable attachments, nail scissors, nail clippers, toe separators and a nail brush. The only thing missing is some nail polish! Carry on reading as I’ve included a lovely polish set to accompany this one perfectly! 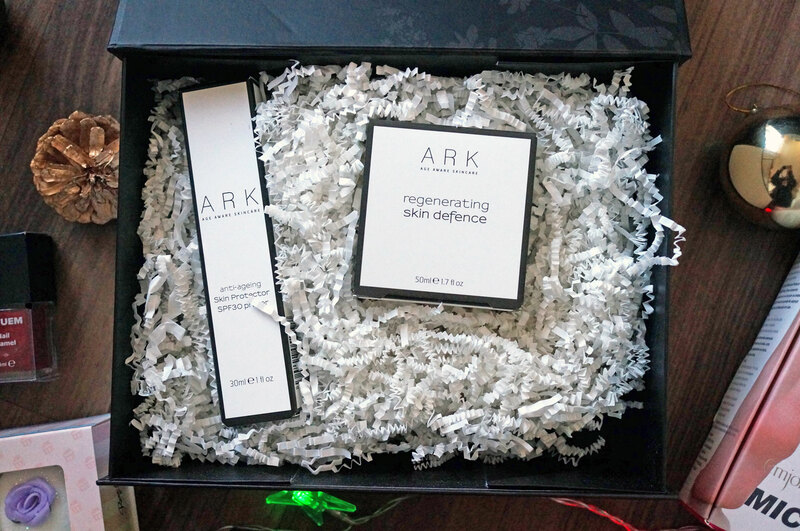 The Innovation Collection* £90 by ARK Skincare. This gift set really is indulgence at it’s best. ARK’s Innovation Collection contains two luxury products – firstly the Regenerating Skin Defence 50ml – this is a serum that utilises advanced plant stem-cell technology to repair and regenerate skin cells, to reveal brighter and younger looking skin. Alpine Rose Leaf Stem Cells protect against environmental stress and boost epidermal regeneration, Camelina Oil improves skin elasticity and suppleness, Vitamins C, E and B3 are anti-inflammatory, reducing redness and increasing smoothness and Hyaluronic Acid plumps and intensely moisturises to increase firmness. This super serum defends against the effects of ageing and environmental stress whilst stimulating skin repair. It creates a silky skin feel and blurs fine lines and wrinkles for a soft-focus finish, and over time skin becomes firmer and more supple. There’s also a 30ml SPF30 Primer in the box, this skin-perfecting daily defence primer is packed with beneficial ingredients to protect and hydrate skin. It contains Vitamin E which is an amazing antioxidant, Shea Butter to nourish and protect from free radicals and Sunflower. This primer creates the perfect base for your makeup whilst providing clinically-proven skin benefits, and defending against UVA and UVB rays to prevent sun damage and premature ageing. If this set sounds good to you, it’s definitely worth snapping it up as you save an impressive £16 compared to if you purchased the same products individually! 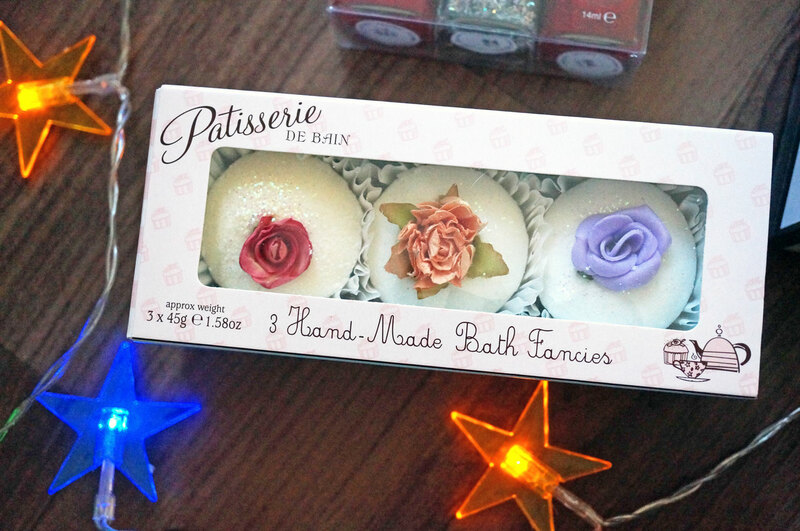 Patisserie de Bain Bath Fancies* £10 from Beauty Naturals. This super sweet gift set contains three hand made fragrant bath melts in a pretty pink patisserie box. Inspired by the traditional French patisserie & handmade in Yorkshire, these dainty little bath melts are made entirely from natural ingredients & scented with pure essential oils, they really do look good enough to eat! Just throw the melt in the bath where it will dissolve and sparkle gently whilst releasing moisturising shea & cocoa butter to soften the skin, and fragrant essential oils to give a lovely fragrance to your bath. This would make a great secret santa gift! 2ml Perfume Sample Set* £29.95 by St Kitts Herbery. If you’re on the hunt for something a little different to the off the shelf brand names this Christmas, this sample fragrance set from St Kitt’s could be just what you’re looking for. The set includes all ten of their fabulous fragrances in 2ml spray bottles, it’s a great way to try them all and find out which your favourite is! Included fragrances are; Bergamot, Mist, Colonial, Summer Rose, Patchouli, Geranium, Moonlight, Violet, Rose Maroc, and Black Rose. 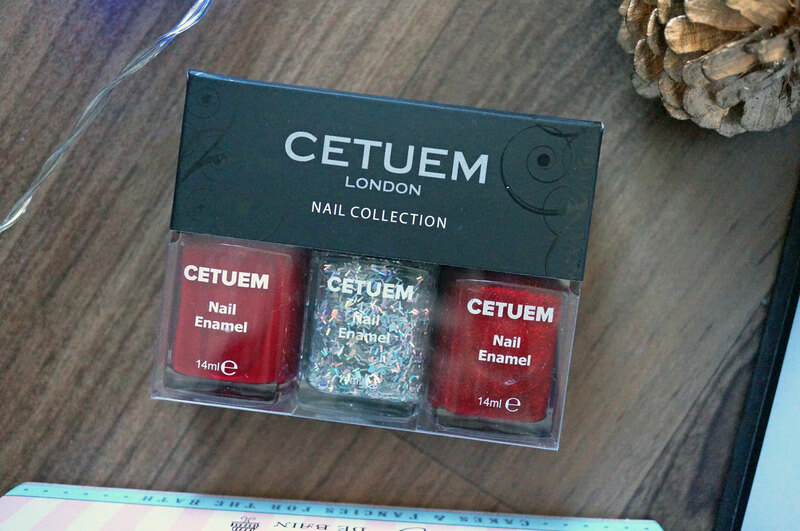 Christmas Trio Nail Polish Set* £29 by Cetuem. This lovely little set contains three fantastic shades to create fabulous festive nails this party season! The polishes don’t have shade names but there is a beautiful deep red, a topcoat that contains holographic silver strips suspended in a clear polish, and a fine red glitter polish. The red glitter looks amazing on top of the red polish, and the holo top coat would be perfect for a statement nail! Pure Rose Indulgence Gift Set* £29 by Elemis. 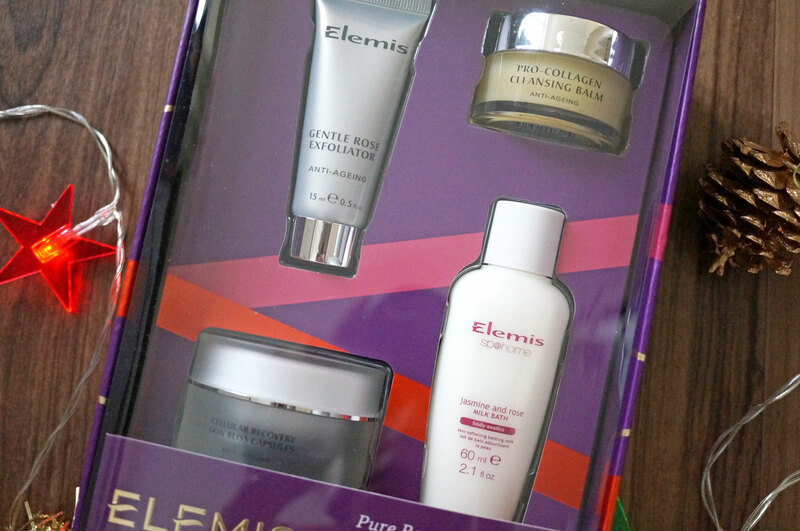 Elemis are one of my favourite skincare brands, and this set of mini sized products would make a fantastic gift for a long term fan like me, but it would also be the perfect gift for someone new to the brand so they can try out a selection of products. The Pure Rose Indulgence Gift Set includes a 60ml bottle of new jasmine and rose milk bath, a 20ml tub of pro-collagen cleansing balm, a 15ml tube of gentle rose exfoliator, and a 14 day packet of cellular recovery skin bliss capsules. The set contains active fragrances to relax, soothe and boost face, body and mind, and the products are presented in a beautifully stylish box, making this the ideal gift for someone special this Christmas. And before I forget, I also wanted to mention my awesome new battery powered Star Lights from LED Hut! These are so handy simply because there’s no plug, you can just put them wherever you like!